Local Farmers have set their clocks forward, but clocks are not the only things springing ahead on these newly warm days. It’s time to set into action for planting cool weather crops. 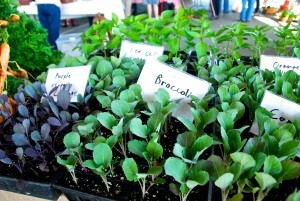 The plans (and plantings) the farmers make now will show up at the summer market in just a few short months, even weeks! The fabulous thing about cool weather crops such as kale, collards and mixed lettuces is how easy they are to grow in smaller plots of land such as raised beds and containers on your patio. Any home improvement store will have starter plants for the home gardener- but just like your food, it is better to buy local. Did you know that local plants are healthier for you and the environment? 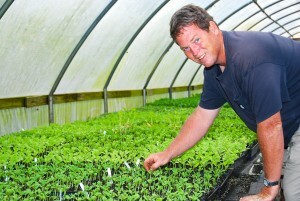 A local starter plants from the farmer you trust at the Franklin Market has not traveled thousands of miles. It is grown in the same Tennessee environment that you need it to be grown in. It has not been in a semi truck left to wilt and then jolted back “awake” with artificial stimulants and too much water. Instead, your local farmer has cared for it from seed to plant, has given it just enough water and has made sure it has naturally “hardened” for you to take out of its protective farmer environment and plant it in your own loving care. If you’re one who has also wanted to try your hand at farming, you need not really have a green thumb. 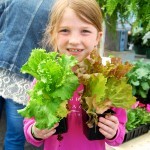 Spring plantings are an easy way to bring “locally grown” to your home garden, and a wonderful way to teach children how to grow food. Talk to our farmers at the market who have starter plants for sell, such as Carl from Kirkview Farm or Stacy from Paradise Produce. They will tell you what kind of seed it is, how deep to plant it, how much room it needs and how much water it needs. They will tell you the signs to look for when it’s ready to harvest, and they will even tell you how to cook it when it’s ready! The term locally grown is not taken lightly at the Franklins Farmers market, and neither is “good for you” or “healthy.” We have more than just good for you, healthy food at the market, though- our artisans create natural products for the body and soul! 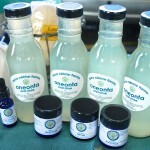 Lotions, powders, essential oil salves, deodorants, toothpaste, soaps, candles and bug spray are available at the Franklin Farmers Market every Saturday. These aren’t products made and stored in warehouses-these are lovingly made in the home or certified kitchen of a local artisan you know and trust. With warmer weather comes annoying bugs, but Jody of Ecodiva has you covered, literally, in her “Bug Me Not” spray. Buy a bottle at this week’s market, and in a few months when you run out, bring that bottle back to the market to get it refilled for half the price! 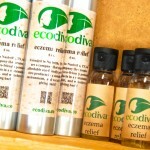 Many people suffer from eczema, but Ecodiva has a special line of products that have helped our market customers, and that’s not all that they make! 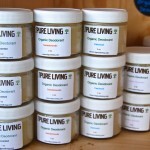 Pure Living has a sign that fittingly says, “Be Kind to Your Body.” Debra makes a deodorant that is a customer favorite- talk to her about the essential oils she uses in her products and I’m sure you will see why it is important to be kind to your body. Terra Nektar Farms didn’t start out as a farm, but homeschooling and raising healthy children led Rand and Aysha to making better choices for their family in more ways than the food they eat. From tooth powders to salves, they are passionate and knowledgeable about their products and why they use the natural ingredients. 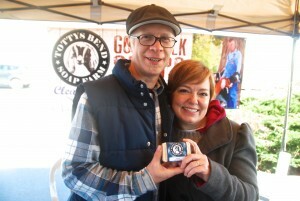 Totty’s Bend goat milk powder and soap will have you staying fresh all spring and summer. Talk to Nate and Vanessa about their goats and you’ll see just how much love and care really does go into their products. Last weekend while I was shopping their famous body powder, we talked about the process of weaning baby goats from their mothers- a natural process that needs to be done, but never the less can be hard, as any mother knows, to let the growing up begin. I got teary eyed and even gave way too much information about my own weaning process (of my lambs, but I probably told about the human baby, too, who knows). That’s how it goes at our market, personal conversations happen because we know and trust who grows our vegetables, bakes our bread, raises our meat and makes our body care products. Locally grown, locally made- that’s the way it is at our local farmers market! Come see us every Saturday 9am-12pm through March, then add an extra hour in April till 1pm. This entry was posted in Market Saturday News on March 14, 2016 . 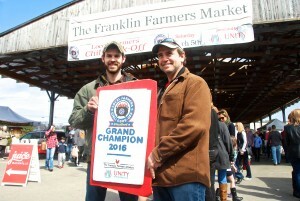 Everyone thinks they have the best chili recipe and one local farmer proved it at the Local Farmers’ Chili Cook-Off held at the Franklin Farmers Market on Saturday, March 5, 2016. Eight meat vendors participated in what is sure to be a popular event at the market in coming years. 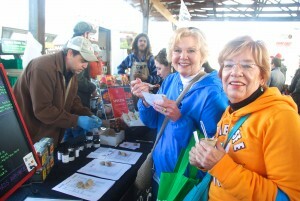 Customers were treated to each of the farmers’ special recipe made from either chicken, beef, lamb and even bison! Chili Cook-Off tasting began at 9am and ballots were cast in a race to find out which farmer had the best chili. The Franklin Farmers Market has the largest selection of local meats in middle Tennessee. Participating farmers were Triple L Ranch, Red Cedar Bison Ranch, Bear Creek Farm, Little Spring Creek Farm, Hatcher Family Dairy, River Cottage Farm, Beaverdam Creek Farm and West Wind Farms. 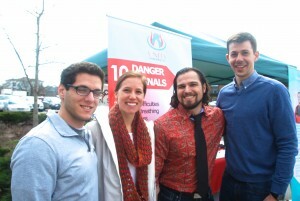 Chili cook-off sponsor, Dr. Devan Arman of Unity Chiropractic, was proud to be part of the inaugural event and said they are always thrilled to be involved in the Franklin farmers market. Their goal is to bring “unity within the community, and empower the community to take care of themselves from the inside out,” and shopping at the farmers market will help the community make healthy food choices. To make their sponsorship even better, Unity Chiropractic is offering a special promo code for this event. 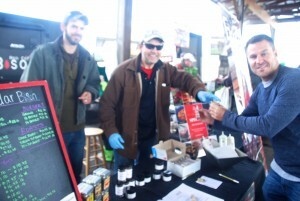 Customers can visit their website, www.unitychirotn.com and use code CHILI for $55 off their first evaluation. Tom made his first barn wood sign 6 years ago when a tornado blew a friend’s barn down. He’s been enjoying the beauty of barn wood ever since and “loves taking something nature knocked down and turning it into something people can enjoy for years and years.” Customers stood in front of his booth at the market and gazed with admiration at his work. Nature may have torn down one work of art, but Tom’s natural talent has allowed the barn history to continue in someone’s home. 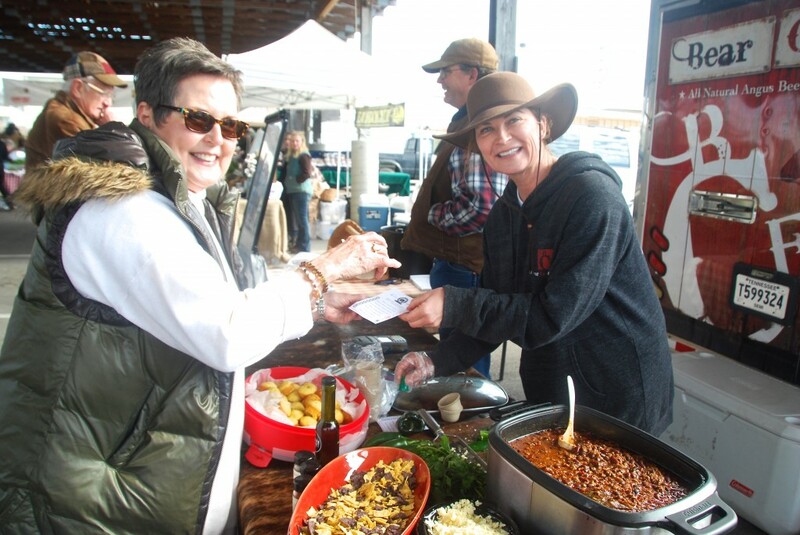 Over one hundred customers sampled and cast their vote on who should be crowned the Grand Champion of the first ever Local Farmers’ Chili Cook-Off. After much anticipation the winner was announced- Red Cedar Bison Ranch in Chapel Hill, TN. Owners of the second generation family business, Dennis Fioravanti and Brock Hughey were ecstatic to prove that their bison chili recipe really is the best! 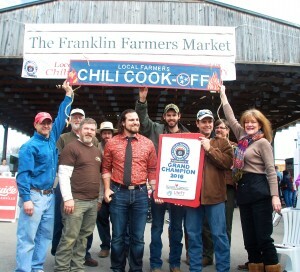 For more information about the participating vendors in the Local Farmers’ Chili Cook-Off, visit the Franklin Farmers Market every Saturday at the Franklin Factory, 230 Franklin Road, Franklin, TN 9am-12pm. This entry was posted in Market Festivals, Market Saturday News on March 6, 2016 .